Happy Memorial Day weekend to all of my US pals. I heard that my UK pals get a long weekend too! It's been a pretty nice week here, and I've got lots of exciting things to report. So let's get on with it shall we? KONG Treats Giveaway Winners Announced! I will be sending you an email sometime this weekend - congratulations! Response is required within 48 hours to claim the prize, or else I will need to select a new winner. This rule is in place due to past issues with giveaway winners, so thanks for understanding. Earlier this week, blog friends Mollie & Alfie organized an auction and raffle to help support Leo. 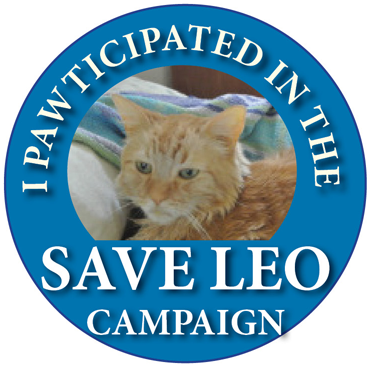 Leo is a cat who has been diagnosed with hepatic lipidosis and in an effort to save his life, had a feeding tube inserted. All of his medical bills add up for both his fosters (Savannah's pawrents) and the rescue organization. The raffle and auction helped to raise more than $400 to help support Leo's expenses. Our good friend Misaki created this badge for those who participated in the event somehow. She was also a big help in the auction. I bought some raffle tickets and actually won 2nd place! The prize is a mouse pad from Mollie & Alfie's shop and I can't wait to see it and share it with everyone. I also won the item that I bid on, and can't wait to share that with everyone too. 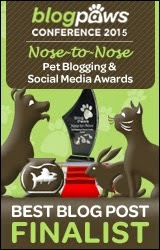 Speaking of Mollie & Alfie, they were featured on my other blog yesterday. If you'd like to check it out just click here! 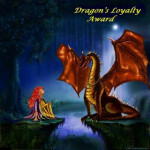 And speaking of Misaki, she gave me this awesome Dragon Loyalty Award which I haven't seen yet - thanks Misaki! I'm not sure if this classifies as an award, but it's still fun nonetheless - I was tagged by my pal Speedy the Cheeky House Bunny! So I guess that means I'm it. I'll be honest that I'm going to cheat a little bit on the being tagged rules. I'm a little pressed for time because my boyfriend just spent the last hour trying to fix the connection from my laptop to my phone so I could grab some pictures. (It still doesn't work!) Therefore, I'm just going to answer the questions presented by Speedy. 1. What is your favorite place in the whole world? This is kind of a tough question... but I'm going to say our lakehouse at Lake Travis. Here's a picture of Shiner on our dock. 2. Why is it your favorite place? Well, I've been going there since I was a little kid! I love water activities like swimming, water skiing, fishing, etc. Plus, my younger brother lives out there now so I can visit him when I go there. 3. What is the funniest thing you have ever done? 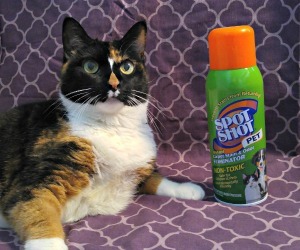 I've done lots of funny stuff... once I found this cat that looked like Kitty Kitty Meow Meow in my house. I have no idea where he came from. I decided it would be funny to put him under my brother's bed and tell him that KKMM was under there and wouldn't come out. 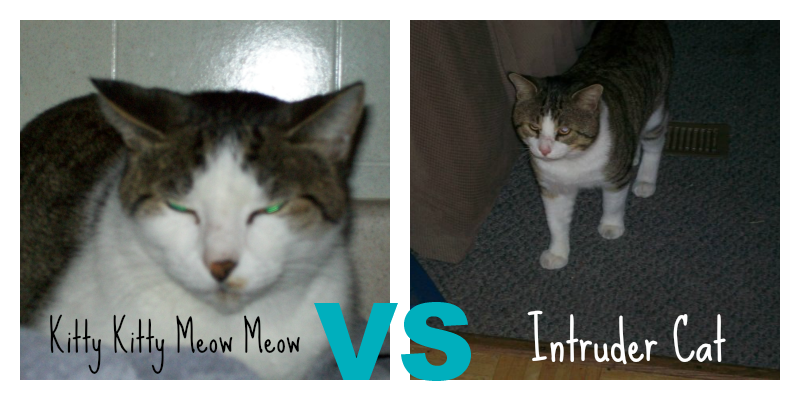 He went in his room and tried to coax the cat out, thinking it was his cat and when he got closer he realized it wasn't. He freaked out a bit. I don't know if that's the funniest, but it's one of the first things that came to mind. 4. What's your favorite treat? Cadburry Creme Eggs... although I got a bit burnt out from Easter. 5. If there was one thing you wanted to do above all others what would it be? Another tough one! There are tons of things I'd love to do... mostly travel. I'll say travel the world! 6. What is your favorite play thing? Hmmm this one may be more geared towards some anipals. I suppose my favorite play thing is my laptop. 8. Sunshine or Rain - which do you prefer? I think I ultimately prefer sunshine... but the rain does make it cooler out when it's really hot in the summer. 9. What's your favorite plant? 10. If you could have any 3 course meal, what would you have? Probably fruit punch or lemonade. I'm not a big soda drinker. I didn't want the babies to get eaten by him so I scooped them up and brought them inside. There was some blood on a few of them, but I could never find any wounds. There were four of them. The next day, I decided to return them to their nest in hopes that the mommy bunny would return but she never did. I know they feed at night only, so I watched and watched. The yard had just been mowed so I'm sure the lawn mower scared all the bunnies away. I brought the babies back in late that night and am now trying to take care of them. One of the bunnies was not alive when I returned to the nest. After I brought them in again, I saw a HUGE owl sitting above their nest on the swings... I'm sure he would have snatched them up too. Caring for wild cottontail rabbits can be extremely difficult and from what I've heard, does not have a high success rate... Thanks to Speedy's mum for chatting with me about the babies and giving some advice! Again - I hope you all have a great weekend! 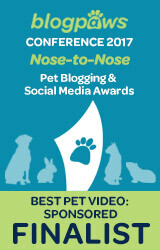 Take a moment to visit some of the other great pet blogs and see what they're up to this weekend! Thanks guys. I've tried to care for an older baby that my cat injured. That one wasn't as lucky though =/ there wasn't much I could do for him. Congrats to the winners and to you for your award. Good luck with those bunnies! Gosh good luck with the bunnies. If anyone can see them right it is you Ann. Have a super Saturday. Congratulations ... your dock reminds me of "sitting on a dock of a bay" - it must be a wonderful place! 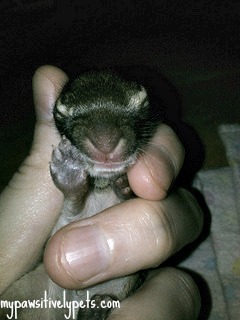 Paws crossed for the little bunny-babbies. Nice stuff and congrats on the award. We love that Leo and are so proud of everyone helping him. I just love him too... I think it was an amazing outcome from all the people that helped in some way! Congrats on the award and hope you can help those bunnies. Concats on the award! We think Mollie & Alfie are awesome for raising funds for Leo! Thanks guys... everyone who helped is awesome! They sure are a creative pair though. I know... I just love your mouse pad Giz! ConCats on the award! I love to learn new things about people too (being nosy!) 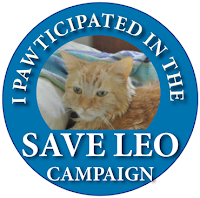 It was great how everyone pulled together to help sweet Leo> Have a great holiday weekend (we have one too). Congratulations on your award and on your luck in the raffle and auction. Do you know this was the first year the peeps didn't have any Cadbury eggs cos they cost like a buck apiece around here. Bummer. I hope your bunnies survive so they can produce Cadbury eggs. I'll bet there was blod on them cos that armadillo ate the Mama. Wow! Fab things happening Ann! First off, congrats on your awards! Secondly, LOVE the Shiner pic. Does she go swimming? 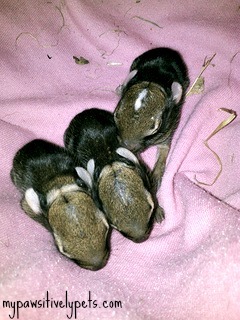 The baby bunnies are so cute! I remember as a child we would always have wild baby bunnies in our yard. We'd capture them and try to keep them. Silly us, the eventually passed on :( . Purple is my fav too! Happy Memorial Day weekend! Those baby bunnies are so adorable....poor little things. I hope all goes well with you taking care of them. I think that was me that won, unless there's another Janet K out there? The dogs sure hope so, they are always excited to try new treats! Congrats on the award...I enjoyed reading your answers to the questions. It's always fun to learn a little bit more about fellow bloggers. Hey Jan - I do believe it was you that won :) I haven't sent the emails out yet since it's a holiday weekend. I thought it might be more fair if I waited til the weekend was almost over. I'm sure your pups will love them! Aww those bunnies are soooo cute! They sure are... unfortunately another died last night, but I saw it coming with that one. It lived a bit longer than I expected it to. Congrats on your award. Taking care of baby bunnies sounds like a big job. It is time consuming so far!